When I read RÁJEN's blog post (in Hungarian) about his 854 Technic gokart I became nostalgic. Just like him it was my first ever Technic set and unlike I him I still have the majority of the parts. So I have decided to put it together. When the Expert Builder series was started in 1977 it introduced four new sets that were joined by two others in 1978. The top of the range was the 853 Big Car and the smaller set (by number of bricks) was this gokart - this was the entry set of Technic. I got mine approximately in 1985 from my parents, they have bought it in Turkey as getting Legos in the Eastern Block was somewhat difficult. I think I did not put it together in the last 15 years or so. When I built it I tried to use the oldest parts available (especially with blue bricks the shade difference is obvious). I did not use the Technic connectors though as almost all of them broke or cracked during playing with them, and the same happened with the universal joint. To my surprise I managed to buy brand new connectors during one of my Legoland tours, now I have used those. I was not a particularly caring kid when dealing with Legos. It is a smaller miracle that I still have the original instructions. When I found it I was a bit surprised to see that it has a crane on its cover that I have not seen since as a set. The actual building instructions for the gokart start around the middle, the rest has generic tips and some unrelated building guides. My theory is that the Lego company emphasized that from Technic sets one can build anything. IV. What is in the box? Classic Technic parts from the same era as the 853, but here blue is the dominant color. There are two Technic bricks of length 16, some of size 8, 4 and 2. There are many plates, amongst them 6 rotating plates for the steering. There are also some black parts (seat, engine) as well as some yellow and white ones. There is three 24-tooth gear and two 8-tooth. The axles are kept in position by classic bushes and connectors, it also has a universal joint. There is a sticker and two flexible tubes that are in surprisingly good condition considering they are 25 years old. Oh, and there is the steering wheel. As this is an entry-level set the list of functions is not very long. Steering works as one could expect and in the back we find a single-cylinder piston engine that is connected to the left rear wheel. The designers probably thought that connecting it to both wheels would cause too much tension for the gears - I also agree that this seems more durable than the joint on the 853. The design is not overemphasized, functions are more important. Despite this it looks pretty gokart-like. It has a number plate (that looks quite ok even without the sticker) and two tubes connected to the engine. It also has a seat that can be tilted a bit. One minor nit is that real gokarts tend to have the engine on the side rather than in the back, just like on the later 8842 gokart. As a final score it gets 9/10, probably heavily influenced by personal memories. 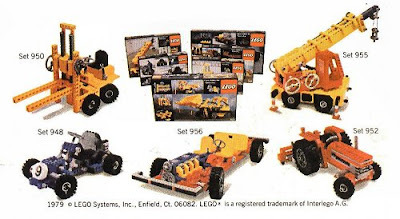 I think this was a really good starter set in its era and contains largely generic parts that can be used to build almost anything. When comparing it to the 2010 entry model Telehandler the gokart is quite a bit larger. It also contains almost twice as many parts (its price tag is also steeper). To summarize, a good starter set with universally usable parts. Nice post! I enjoyed reading it, it was nice of you to put images as well. Thanks for sharing.